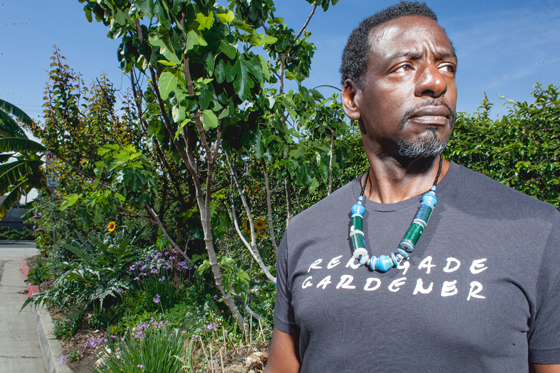 Armed with a shovel, some soil and seeds, Ron Finley has come to be known as the “Gangster Gardener”, and his unexpected tactics have made him one of L.A.s most widely known activists. Frustrated by his community’s lack of access to fresh, organic food, Finley inadvertently started a revolution when he turned the parkway in front of his South Central L.A. home into an edible garden. When the city cited him for his plantings, Finley started a bureaucratic battle, gathering signatures and working with local officials until the archaic city ordinances were abolished. His TED Talk has been viewed by more than six million people to date. With so much momentum behind him, he began to focus his energy on The Ron Finley Project, which has ignited a horticultural revolution worldwide. His latest undertaking is a permanent space that serves as a garden, café, educational center, park and community gathering place. The Well will screen the film about Ron “Can You Dig This” prior to his visit with us. Currently, Ron is engaged in a battle to save the land where his headquarters. Help us raise some money for Ron’s work and for our coalition building here in Seattle. If you represent a youth organization and are looking for scholarships, please contact us at thewellqueenann@gmail.com.